The key objectives of this project are to determine the required modifications to the current Units of Competency for inspecting, monitoring and reporting the condition of off-the-road tyres, to more accurately reflect job roles and industry needs. The Case for Change for this project was established as a result of initial research and consultation undertaken by the previous automotive Industry Skills Council, Auto Skills Australia. The project was submitted in a Case for Change – previously referred to as a Business Case – to the Australian Industry and Skills Committee (AISC) in December 2016. On behalf of the Automotive Light Vehicle Industry Reference Committee (IRC), PwC’s Skills for Australia carried out industry consultations for this project in 2017 and early 2018. 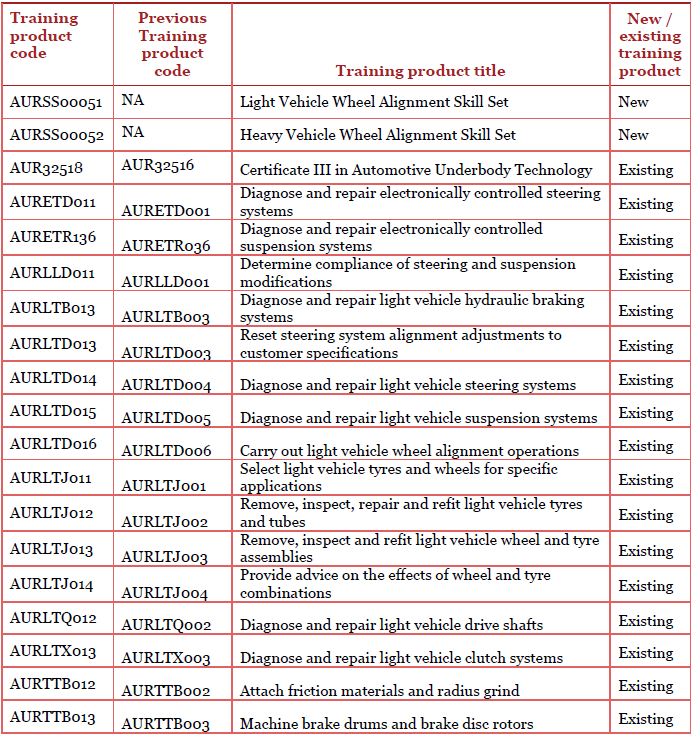 Stakeholder feedback has indicated confusion over the current purpose of the Certificate III in Automotive Underbody Technology and identified the potential for this qualification to fulfil an industry need by restructuring it to align closely to the “fast fit” automotive repair businesses sector. The consultation period for feedback on draft training products has now closed. A Case for Endorsement was submitted to the AISC on behalf of the Light Vehicle IRC in July 2018. It will be considered in August 2018. Thank you to all those who provided their valuable input, and remember to subscribe to our mailing list to be kept up to date on how the project is progressing. The Case for Endorsement for the review of the Certificate III in Automotive Underbody Technology and wheel alignment training was approved by the AISC in October 2018. Resulting changes to the Training Package can be viewed in the Case for Endorsement document below. These changes are now reflected on the Training.gov.au website. For updates on the Training Package, please subscribe to our mailing list.